Heroes put others first. Heroes sacrifice—sometimes with their lives. NFL player Pat Tillman was not a boxer but he was a legitimate hero having been killed in Afghanistan under especially tragic circumstances. Notre Dame’s Rocky Bleier, having been drafted, survived the Vietnam War but was badly wounded twice on a mission to extract wounded and dead. He went on to a successful football career with the Pittsburgh Steelers. The highly decorated Don Steinbrenner and Bob Kasul, the only professional football players to have been killed in action in Vietnam, were not so fortunate. Stephen Williford, a 55-year-old plumber, chased down and caused the demise of a mass shooter in 2017 who had just slaughtered 26 people in a Sutherland Springs, Texas church. Stephen Williford was a hero. When Egypt’s Anwar Sadat and Israel’s Menachem Begin reached for each other to negotiate a peace treaty, they both became instant heroes not to mention Nobel Peace Prize winners. Both put others first. Sadat would pay with his life. Martin Luther King Jr. lived his life in an heroic manner and so did Nelson Mandela and Steve Biko as they fought Jim Crow and apartheid, respectively. Dr. King and Steve Biko paid dearly. JFK also paid, suggesting that heroes seldom live a full life. Some names are automatically associated with heroism such as Jesse Owens who won four gold medals in the 1936 Olympics. However, when a boxer is referred to as a hero, far more often than not this label is being misused. When Joe Louis destroyed Max Schmeling in their rematch in Yankee Stadium on June 22, 1938, the fight carried with it major international implications. It was more than just a fight and Joe became America’s hero. Poor Max really wasn’t the enemy at that time but he was perceived as such and perception is often a big part of reality. There are many perceived heroes in boxing, but relatively few real ones. The spectacle of muscular Danny Nardico and Charlie Norkus engaging in one of the greatest Pier Six brawls in history belied the fact that each was a veteran and one, Nardico, was highly decorated. Here were two ex-Marines, both possessing paralyzing power, meeting in Miami Beach in 1954 and there was palpable anticipation of a great fight. What the fans got went well beyond that. Muhammad Ali’s refusal to be drafted under arguments that were later affirmed by the Supreme Court gave him hero stature to many—but not all. Later, however, and as he moved to a centrist position in his beliefs, the heroism of what he did began to cast itself in history. Michael Watson boxed in a fast and furious lane, along with Nigel Benn, Carl Thompson, and Chris Eubank, but Watson, known as the “Force,” stood out, not just for his boxing achievements, which were considerable, but for something else. In an incredible back-and-forth classic with Eubank in 1991 (it was Britain’s version of Hagler-Hearns) Watson, ahead on points, was nailed with a paralyzing uppercut and hit the back of his head against the second strand of ropes. The “Force” spent over a month in a coma, had six brain operations, and then spent over a year in intensive care and rehabilitation and six more grueling years in a wheelchair while he ever-so-gradually recovered some movements and regained the ability to speak and write. No one really expected him to live, much less talk or write, yet against all odds he finished the London Marathon on April 19, 2003, capturing the hearts and emotions of an entire nation. As people wept in joy and urged him on, he walked six days. He reached his goal after twelve long years, too many operations and hospitals, and years in a wheelchair. But he trained for months and completed his goal of 26 miles and 385 yards. 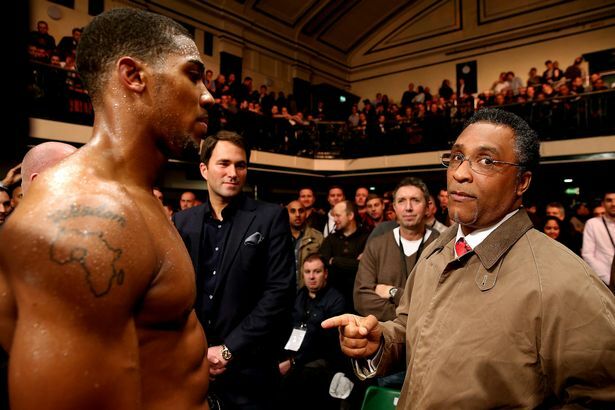 If heroism is measured by an incredible fighting heart and the inspiration it spawned, then Michael Watson (pictured in 2013 with Anthony Joshua) is indeed a hero. Curiously, three-time world champion Bobby Czyz, now 56, carried the nickname “Matinee Idol,” but Bobby has now hit some rough times. If someone in boxing would step up and help him, that someone just might be a real life hero. This holds true for many other ex-fighters who have stumbled along the way. Heroes are in short supply when it comes to helping ex-boxers, but there are some organizations that provide support. Iceman John Scully quickly comes to mind as someone out there helping ex-boxers find their way. The late Vernon Forrest embraced the value of giving back. A great boxer, he was also known for his humanitarian work for the non-profit and still thriving organization Destiny’s Child. Vernon possessed great core values. Vernon Forrest was special in many ways, He inspired people. There are few heroes out there but Vernon was one. Manny Pacquiao’s rise from abject poverty and street urchin to Senator and idolized boxer in the Philippines is not heroic in itself but his giving back to his people makes him one of the few boxers who earned that stature. Yes, he went through a period of “wicked ways,” but he has redeemed himself in those respects and has become the quintessential shooting star. Can you think of other boxers– past or present– who meet your definition of a hero?